Every Monday and Wednesday, we'll announce a new Wildcard winner: a recipe that may not have been entered in (or won) a contest, but a recipe that we've tested and loved. WHO: FamilyStyle Food is a private chef and blogger living in St. Louis. WHAT: Our new go-to pastry for whenever the mood strikes. HOW: Mix your ingredients in a bowl, spoon into muffin tins, and watch them puff in the oven. 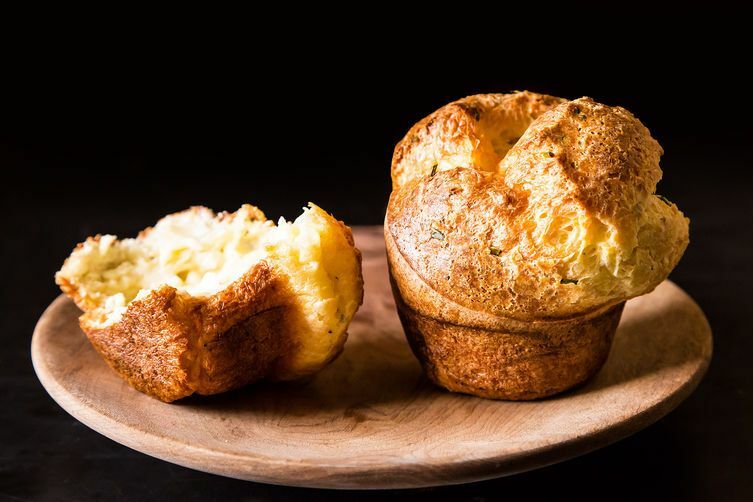 WHY WE LOVE IT: We love how delicate -- and distinctly savory -- FamilyStyle Food's popovers are. You most likely have the ingredients hanging in your pantry right now -- what are you waiting for? Did I miss the memo??? Mine didn't do ANY rising. Zero pop!!! Congrats and what a winner recipe! As for the flour, on many measuring cups there is a marking for ounces as well as cups. One cup is 8 ounces. The batter is more like a thin pancake batter. I love popovers and any popover recipe can be followed. I love the use of blue cheese, yum! There used to be a retaurant in California called the Proud Popover. Does anyone remember it? Popovers can be filled with stews or pot pie filling and even fruit mixtures. They are so delicious and versatile. Actually, one cup of flour should (usually) weigh 5 oz. One cup of liquid should weigh 8 oz.! First time popover maker here! Loved them! I added a strong blue cheese in place of the parmesan for a bit of a kick. It was savory! This is probably really basic and obvious, but the flour is by weight, not volume? I too had this question, so hoping for an answer. Since I don't have a scale, do I use 2 1/2 cups sifted flour? These look and sound amazing. I am mourning the vanishing of my cast iron popover pan (the kind with 11 wholes), and the now gluten free spouse. I'll adapt and sneak! Oh, I want one of these right now! Congratulations FamilyStyleFood! I have a feeling I'll be baking these this weekend. These were so good -- I had to keep myself from eating the whole pan when we tested them. I think I ate what you didn't eat. Congrats!! These look so good!